Thanks again for another intriguing post. Your blog is becoming something i really look forward to reading. I love seeing your rendition of other stuff like starwars, muppets, ect. I also so really love the Mouse Guard version of stuff you've done in the past like indiana Jones and lotr and all that. It will be fun to see if you ever get around to doing work in some of these fields. 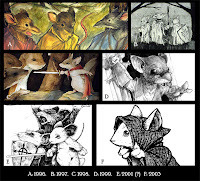 I also love the renditions other artists do on Mouse Guard. They're diferent, but very stylistic and beautiful. Evan though i'm not a huge magic fan, i'm really looking forward to you delving into mice superstition and prophesies and afterlife and the like. It sounds most interesting, i just hate haveing to wait so long for everything. 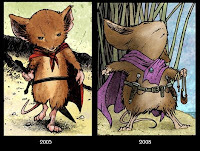 I'm glad Mouse Guard turned out the way it did stylistically. It's beutiful, i think you've perfected it a long way from those first ratlike drawings. I love seeing those though. 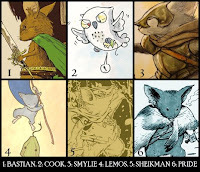 Thinking about what the future might hold for Mouse Guard is very exiting. I'll be waiting on the edge of my seat for anything new. Regarding magic, I think you take the right approach David. Anything that seems unnatural or unbelievable was often considered magic in olden times, and I'm sure if someone came along with the ability to teleport we today would think the same. The Japanese were fascinated by the mystique, power and machinations of how it worked after the introduction of "the black powder" (aka gunpower) into their culture during the early 17th century and looked to harness it as much as they could. 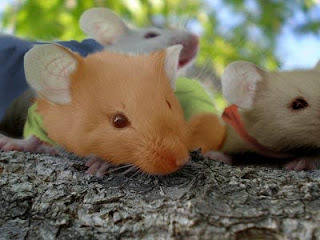 Something similar along those lines may fit into the Mouse Guard realm. Hi David! Thanks again for the awesome post and taking the time to answer some questions. I'm really glad to hear that you're taking your time with the movie process. I think if creators were given more control over film adaptations, we'd end up with movies that truly honor the original source of inspiration. Please take your time with it. I'm just happy to know that there is a strong possibility for an MG movie down the road. I attended a panel discussion at last year's LA Times Festival of Books that featured Jeph Loeb, Steve Niles, and Mike Mignola. One of the fans asked them what the process was like having their work turned into movies. 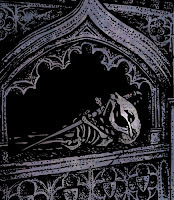 Both Mignola and Niles told us how much of a struggle it was to maintain the original vision of their work. Studio execs were constantly trying to change things, in some cases, rather drastically. Steve told us that during a meeting, one studio exec asked him why he insisted on using Alaska as the setting for "30 Days of Night." The exec wanted to use an urban setting instead. I don't know if you're familiar with "30 Days of Night," but the setting is essential to the entire plot. Steve tried to explain that to the exec as kindly as he could, and luckily managed to retain the original intended setting. I hope you won't have to deal with too many harsh roadblocks during your movie-making process. Best of luck! Looking forward to seeing you guys at NYCC! 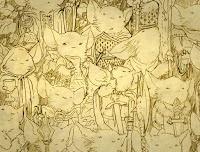 the first thing i thought of when i read Mouseguard is what a great movie it would make! Im glad your taking the time to do things well! Kind of a late response but it would be really awesome to see you do some TMNT! Turtle Power! The turtles are one of my favorite comic series, unique in art and story. 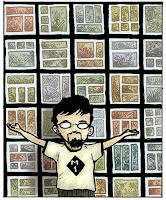 I grew up reading the four color graphic novels that First printed. Now, as a comic collector, I've been lucky enough to purchase most of those original issues. The oversized format of the first few issues is awesome! The latest addition to my collection is a third printing of the first issue that I was able to get in near mint condition at a great price. As far as the sketchbooks go, I guess the impression as to their rarity comes from the pretty high prices they are going for on eBay. Since I live in Canada and have not been able to come down for any of the cons, my only option is eBay. But I guess now I'll be waiting for that contest you mentioned!